In the early summer of 1995 Margaret and I made a trip to the mountains above Woodstock, New York where we do a yearly ten-day meditation intensive with our dharma teacher Khenpo Karthar Rinpoche at his Tibetan Buddhist monastery (Karma Triyana Monastery). 2014 will be the 26th year we have done this intensive. Khenpo Rinpoche speaks only Tibetan, so there we were in the midst of having a short personal interview with Rinpoche, speaking with him through a translator. I always ask him if there is anything special he wants me to do, and he always answers "Nothing special, just keep practicing." Once again, I had just asked that question and some others, and Rinpoche had begun to answer. But after less than a minute, he just stopped, looked at us, and declared that he was not going to answer further, and that, instead, we should take these questions to His Holiness the 17th Karmapa, who is the head of our lineage. Like the Dalai Lama, the Karmapa is the head of one of the five main lineages of Tibetan Buddhism. Margaret and I looked at each other in amazement because His Holiness could only be found at Tsurphu Monastery (15,000 feet) on the other side of the world, deep in the reaches of Tibet. I mumbled something to Rinpoche about, well, perhaps next year, next spring or something, but Rinpoche looked right at us and said: “No, this Summer, as soon as you can arrange it.” By this time, Khenpo Rinpoche had a great smile on his face as if he were very, very happy for us. We were speechless. He then went on to speak about impermanence, how life is short, and that none of us know the time or manner of our death. I gradually realized he was directing us to go to Tibet soon, like that very summer, and I am the kind of person who takes a day or two to decide if I really want to go to the grocery store. Now that trip is a long story, and you can read the whole thing at this link ("Our Pilgrimage to Tibet"), but here is what happened on one leg of that journey. At that time, we were in Kathmandu and on our way to India, to West Bengal and Sikkim to visit our monasteries there. We were going by plane. When we originally arrived at Kathmandu international airport, we knew nothing about the small domestic airport (right next door) from which we were now about to fly out from to Bhadrapur, a tiny town in southeast Nepal, very close to the Indian border. From there, we planned to cross over into India by jeep at the dangerous border town of Karkavitta and on to Sikkim where we were to visit more Karma Kagyu centers. Karkavitta was a place where you never let your car slow down because people were routinely robbed and sometimes killed trying to pass through there. I was traveling with my wife Margaret, my two teenage daughters, and young son Michael Andrew. All five of us had elected to go and having arrived at this small domestic airport, we managed to wrestle our own luggage away from the army of touts who wanted to "help us," and pile it in front of the tiny office of the Royal Nepal Airlines, who had our tickets. And for the umpteenth time, I confirmed our tickets and managed to weigh our luggage and present it for inspection. As usual, the guards demanded we open up this bag or that one for inspection, only to tell us to forget it the moment we began to comply. I had no idea what kind of plane we would be on, but I suspected (from the size of this airport), it might not be a DC-10. We waited for our flight to be called, with me checking every time any plane was boarded to make sure we were not somehow missing it. Finally it was time and we climbed aboard the small bus that would drive us out to where our plane was waiting. We kept going farther and farther out until we were at the very edge of the airport, passing jets and larger transports, evenutally stopping in front of a tiny propeller plane that seated maybe 16 people. Gulp. The small hatchway of the plane had a 3-4 rung ladder hanging down to the tarmac. Climbing on board, we wedged ourselves into the tiny wire-frame seats and held on. The single flight attendant offered us a tray with cotton for our ears and a piece of candy to help us swallow at higher altitude. Then, with the few people from the bus on board, the pilot climbed in and we took off at once. I couldn’t see much from the tiny porthole windows, but I could see the vast green Kathmandu valley unfolding beneath us. In about an hour, we prepared to land. I looked hard to see the airport, but could see little. We dropped lower and lower. I still could see no runway, only a grassy field where cattle grazed, which of course turned out to be the runway. After they ran the cattle off, bumpity-bump, we landed, swinging around in front of a small ochre-colored building that had a bunch of people in front, and coming came to a halt. Out we climbed. It was very hot as my family and I watched the growing pile of our baggage being tossed from the back of the plane. Already pouring sweat, I went to try and find a taxi to drive us the short distance from the airport to the Indian border town of Karkavitta, said to be about half an hour’s drive. I was hoping to find a driver who might take us across the border and all the way to our destination of Mirik, a small town in West Bengal. “How far to the border?” I asked one driver. "Which border?" he replied. "Why, the Indian border and Karkavitta, of course." "It’s a ten hour drive," he curtly responded. Now here was one confused taxi driver, I thought. The border is no more than one half-hour from here. "No," he said, "the 'Indian' border and Karkavitta are at least 10 hours from here by car." I didn’t get it. "This is Bhadrapur, in eastern Nepal, is it not?" "No my friend, this is Bharitpur, im western Nepal" he replied, some ten hours from the border and in the opposite direction from where we thought we were going. I began to get excited and the airport attendant said in his best Hindu-English accent, "Sir, there is no problem. I can stop the plane," which had begun to taxi away. "I HAVE the authority to stop the plane." "Do stop it," I stammered, "We have to go back to Kathmandu right now!" So much for that idea. The plane just took off and vanished into the shimmering heat, leaving us (along with our 5-foot pile of baggage) standing in a field in one of the hottest parts of Nepal, right at the edge of a tropical jungle. What a deserted feeling that was. The Royal Nepal Airlines ticket agent had misunderstood our destination and interpreted "Bhadrapur" as "Bharitpur." Ouch! After milling around with any number of Nepalese, all trying to speak English, which they could not, we were finally helped by a Brahmin, often the only Nepalese who actually can speak English. There was very little we could do, he gently explained. We would have to wait at least one day for another plane. That was that. I looked around at the sad state of the town we were in. Twenty-four hours here? Because of space, I will cut out the part where I rent two taxis and attempt to drive ten hours to India, at which time the taxi with a young Nepalese driver with our two girls in it disappears, and the Nepalese state police organize a manhunt to find them. That was a heart stopper, but the long and the short of it is, we found them safe, but we were right back where we started from, in tropical Nepal and waiting for the plane back to Kathmandu and another day. Back at the Royal Nepal Airline office I fumed and spouted, refused to pay the young renegade driver much of anything, and arranged to find the most expensive hotel in town, which everyone warned was way too expensive. It was called the Safari Hotel and rooms there went up to $65 a night. It sounded like a deal to me and we packed up all our gear (and girls) and headed for the Safari Hotel. Well, the Safari turned out to be a huge (mostly empty) resort, with a pool, a vast dining room, the works, all built around taking safaris into the middle of the Nepalese jungle, wild tigers and all. After weeks of marginal hotels, we all hopped into the pool and cooled out. And cool was needed, for this was a tropical climate – just plain sweaty-hot. The entranceways and even some rooms had geckos (lizards with suction-cup toes) all over the walls, which were great fun to watch as they caught insects. As we (half starving) waited for dinner to be served at what seemed a very late 7:30 PM, we discovered more about what the Safari Hotel was really all about, which of course (like its name suggests) taking trips into the nearby jungle straddled atop an elephant. That's a new thought. Since we had nothing to do but wait for the next day’s plane, the whole family resolved to set off on elephants the following morning, starting out for the jungle at 5:30 AM. It was our first non-pilgrimage act, and it seemed like the right thing to do. And sure enough, at the crack of dawn there we were, hurtling down back roads in an open jeep, heading toward a jungle. All around us were grass huts and shacks with people and animals, all starting their day. Everywhere along the way were flowers and plants, long roads filled with blossoms in the dawn light. We finally arrived at some kind of a hotel camp overlooking a wide river, on the other side of which was the main jungle. As I peered through the haze I could see herds of deer or antelope moving along the jungle’s edge on the other side. After being offered tea, and warned about deadly snakes on the camp paths, we were guided down a path to a high landing where, one by one, several elephants moved in close and allowed us to climb into the wood-frame baskets securely mounted to their backs. 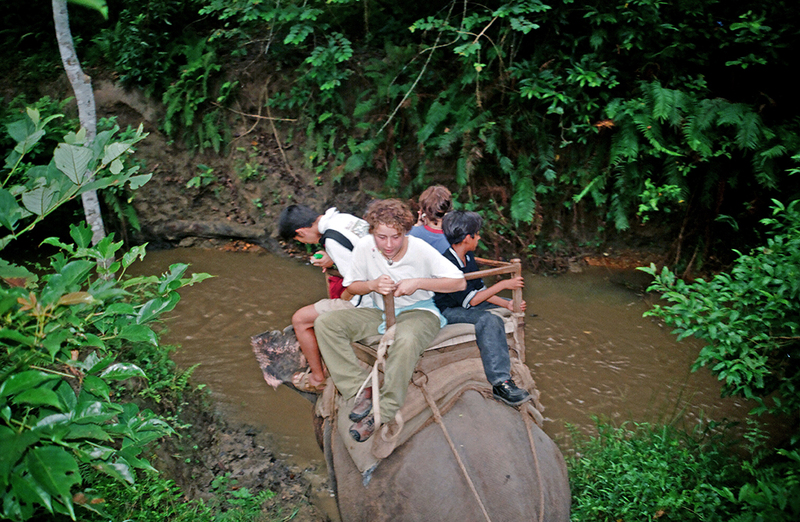 It was four people to an elephant plus the elephant driver sitting way up front. Once on the elephants, they proceeded to walk right down to the river, drank their fill, and began to move out into the mainstream current itself. The river was maybe a quarter mile wide and it had crocodiles. We clung to the small wooden frames which bobbed and weaved as the current got stronger until the elephants finally turned sidewise (facing the current) and began to slowly sidestep their way toward the distant shore, which was a little scary. But gradually we crossed the expanse of the river, climbed up the other shore, and began to move into the jungle proper. It was good to be high up on the elephant because the grass we walked through (appropriately enough, called "elephant grass") was at least a good 5-6 feet high. And we had not forgotten that there were tigers in this jungle. In the beginning there were narrow paths, along which we saw all kinds of deer, wild boar, and, most important, wild rhinoceros. What an experience! Riding high up on the elephants and walking right into a group of three rhinos – a mom, pop, and three year old baby (not so much a baby anymore) standing in a tiny stream. There they were, just that close. And then the elephants left the paths entirely and crashed on through the jungle itself, blazing new trails by tearing off limbs with their trunks and smashing foliage down with their feet. As we made our own trails, hundreds of red insects and torn leaves rained down from the canopy-foliage above. And the elephants would make this deep shuddering sound whenever they smelled something ahead of them in the jungle that they were not sure of. That shuddering sound sure got my attention. And steep-banked muddy narrow streams were forded, with the elephants often having to get down on their knees to climb up the other side after making the crossing. I must say that the jungle was an experience that I won’t soon forget. We sure got right in the middle of a real jungle. It was something. And on the way back, I saw a large crocodile eyeballing us as we crossed the river. Not a time for a swim. be separated, we said goodbye to them at the airport and went on to India.